I trialed a number of other CRMs much to the disgust of my colleagues! Highrise - wanted to love it but too basic and even though we had a free license bundled with Basecamp we didn't use it. Very positive ROI, handles lead and event management really well. Keeps the whole team on the same page. BASIC PLAN INCLUDES TIME SHEET INCLUDES IPHONE & ANDROID APP Log your time on any job you have access to and get a reminder if you forget to submit hours. You can log your time on any job; billable, non-billable, customer jobs, and internal jobs. WorkBook also keeps track of absence entries and holiday requests. 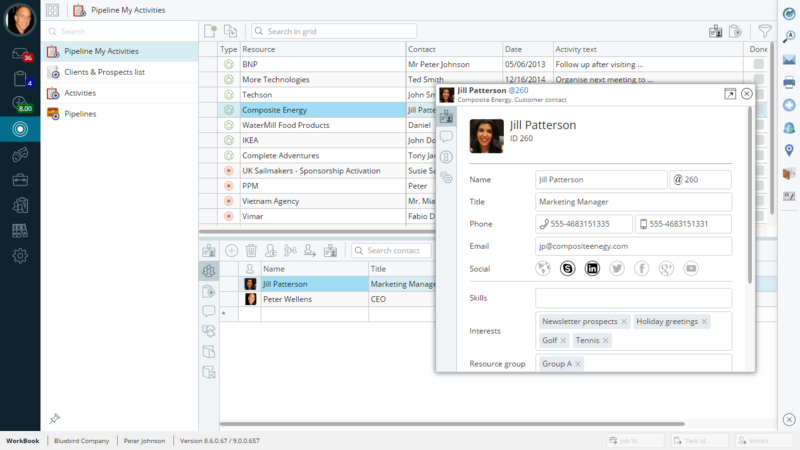 CUSTOMERS & PROJECTS Add as many customers, contacts, and projects/jobs as you like. Jobs are connected to clients and each job can be set to be billable, non-billable, internal, or a client job. COLLABORATION Collaborate with your colleagues and clients and keep track of comments, news, events, and notifications. Receive notifications whenever you need to approve anything, or a warning if something is about to go wrong. FILE SHARING Save all of your files in WorkBook and benefit from having them being kept secure in one, central location. Whenever a new customer or job is added, WorkBook will automatically create a folder structure (decided by you), allowing you to upload all of your documents and briefings to WorkBook. WorkBook will connect directly to your local file server or online storage, which means that you can save your files locally and have them be shown in WorkBook. Moreover, we have options to integrate with Google Drive or Dropbox.